Students from River City Science Academy won the state Science Olympiad Championship in March. 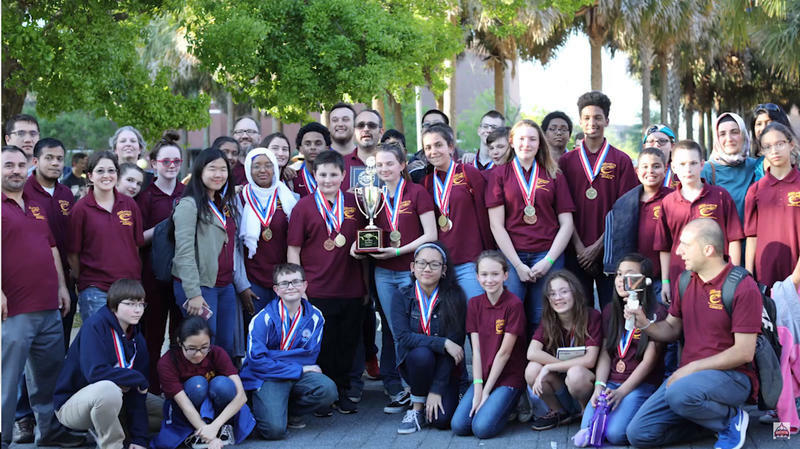 The academy was the first school in Duval County to win the state Science Olympiad Championship. 15-year-old sophomore Ramila Odzakovic, who was on the winning team of 15 students, took home the honor in March. Her school won the state competition against 42 other teams before competing nationally at Colorado State University in May. “You compete against some of the smartest kids in the state of Florida, so just that as itself is a challenge. However, it’s very fun. It’s a great opportunity for every kid,” Odzakovic said. Odzakovic said she wants to become an optometrist, but she has her eyes set on the science Olympiad – especially a forensic event called the Crime Buster. “We couldn’t have made it without our coaches… Especially Mr. [Ahmet] Dastan. He would make us study every day so that we can make it and end up in the national competition,” said 15-year-old Zoi Kirkos, who won in a chemistry-based event called Potion and Poison. Kirkos, who is also one of Odzakovic’s best friends, shared her other goal of scoring well on her next AP Chemistry Test. These students, who compete in topics ranging from meteorology to anatomy, received training sessions and materials from Ahmet Dastan, who is the coordinator of the Science&Math Olympiad. Kirkos said, together, they meet on weekdays for regular advanced training, weekends for group studies and in their own free time. These students at the River City Science Academy are determined to make history a second time this year, competing in the Northern Region at the University of Florida. If they win the state competition, RCSA can represent Florida again at Cornell University next May. “You know, just seeing all the people who are proud of you that you could make it to the national, especially your parents who raise you…That’s an honor,” Odzakovic said, looking ahead to Tuesday’s City Council meeting.